Research shows, for instance, that just 36 percent of registrants sign up outside of seven days leading up to the big event. So if you want to capture the interest of the remaining 64 percent of potential viewers, you need to make a strong push in the week leading up to your presentation. Be mindful of the clock: Send your invitations out either the Friday before the event or early on Monday while your targeted patrons are planning their schedules and prioritizing their tasks. This way, they can build your event into their calendars and rearrange their schedules as needed. You don’t want to wait until Wednesday, in other words, to send out an initial invitation for a Thursday event (although it won’t hurt to send a reminder!). Target specific attendees: Pick out a handful of specific attendees that you really want to attend, and spend some time crafting customized invitations that reflect your relationship with that person. For instance, you could call out an existing customer by name, mention how you appreciate his or her business and personally invite him or her to the event. This little touch of personalization could go a long way in fostering repeat business. Offer incentives: Once it starts getting down to the wire, don’t be afraid to offer special incentives for last minute attendees. 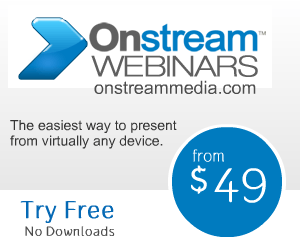 This fun touch will grab the attention of unique visitors and steer them into your webinar. Stay organized: Avoid using traditional email invitations at all cost; instead, take the professional route and invest in a webinar service that comes with a built-in invitation system. This way, you will be able to easily see who you’ve reached out to, who is attending and who needs follow-up reminders.